We offer a nice selection of Standard Jacksons Chameleons for sale here at FL Chams. Standard Jacksons Chameleons are the most common of the 3 Sub Species. These are readily available. As you can see in the photos these are a beautiful chameleon with their marbled pattern of green, brown, and white. Jacksons Chameleons are the modern day Triceratops with their three horns. 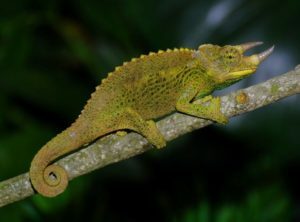 Jacksons Chameleons are one of the 3 hardiest chameleon species available on the market. 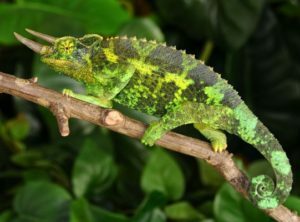 Jacksons Chameleons are a montane species of chameleon that prefers cooler temperatures. Under Chameleon Info checkout Jackson Chameleon Basics for more detailed information.